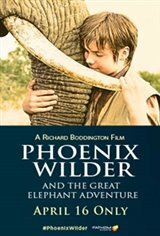 Moviegoers can take a ride through the African plains with two unexpected friends when "Phoenix Wilder: And The Great Elephant Adventure" starring Elizabeth Hurley comes to U.S. cinemas for one night on World Elephant Day, Monday, April 16 at 6:00 p.m. local time. This family-friendly event from Emmy-nominated producer, director and writer Richard Boddington ("The Dogfather," "Against The Wild," "Against The Wild 2") follows a young orphaned boy and his elephant friend on their fight against poaching. Through this remarkable experience, he learns that one person can make a world of difference.